Step back and see the big picture - an exciting opportunity to invest in location and lifestyle and following remedial work to fix the weathertight issues, any astute buyer will know what follows - added value or simply demolish and build your dream home. Invasive builders report is available to help you make an informed decision. Elevated with grandstand views of the eighth tee at the prestigious Mount Maunganui Golf Course - an avid golfers dream! With a large floor plan, upstairs there is a sun-filled open plan kitchen and spacious living and dining area, study, separate toilet and master retreat with large walk in robe and ensuite, while downstairs are two further bedrooms, rumpus room, main bathroom, separate laundry and generous double garaging with dual access and loads of storage and even space for the golf cart! Fantastic freehold 534m² section with a wide golf course frontage and its own private driveway. Beach access a short walk across the road. Great address, great neighbourhood, great aspect, great opportunity. 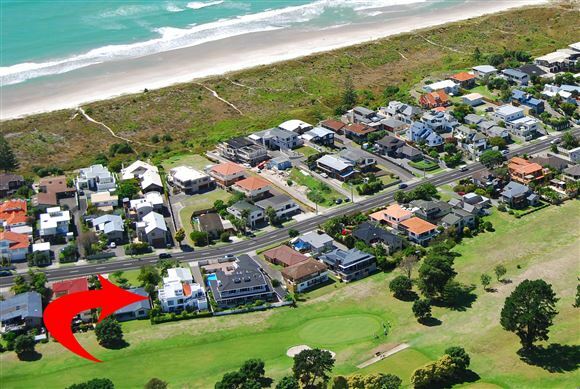 Auction (unless sold prior) - To be held at Harcourts Auction Rooms, 1 Third Avenue, Tauranga on Thursday 5th May 2016 at 1:30pm.